Argentine Tango teacher, professional dancer and tireless apprentice. 1977 born in Buenos Aires, ARGENTINA. Since 2005 she lives between Venice, Italy and Buenos Aires, Argentina. She studied and did experience in different artistic fields: dance, theater and fine arts. Currently she is training in music. She is part of the Dinzel's studio staff in Buenos Aires and works with the Dinzel system, spreading the legacy of her masters in any part of the planet where she goes to teach and show the art of Argentine tango. Fervently join to the essence of argentine Tango, as an embrace and improvisation popular dance, where the concepts of gender equality, social fraternity and freedom are deeply manifested, considering those as the existential basis of the human being. She dances tango since early age, has learned the essence and spirit of this dance, in a natural way and in its true popular context: the first steps with the grandfather and later by the old milongueros of the Confitería La ideal. For many years the tango remains a simple but passionate hobby. Until in 2009 she undertook the professional study. He studied and worked with internationally renowned masters in Buenos Aires and in Europe. In 2010, she went through the doors of the Dinzel studio in Buenos Aires to take the first theoretical lesson with maestro Rodolfo Dinzel. The depth of Rodolfo thoughts awake on her such a curiosity and fascination that will lead her to spend many year studying Dinzel System. In 2014 Rodolfo gave her the privilege and honor of founding the Dinzel school in Venice. Then she discovered to have an intense teaching vocation, that add to inextinguishable desire of knowledge bring her to study intense and constantly. And so in a very short time, Amparo established herself as an internationally recognized Argentinian tango teacher and she began receiving invitations to teach in different parts of the world such as Sweden, Slovakia, Spain and finally in the same Dinzel studio in Buenos Aires. Dinzel System allows her to integrate to tango other disciplines, experiences and knowledge to which she dedicated large part of her live. 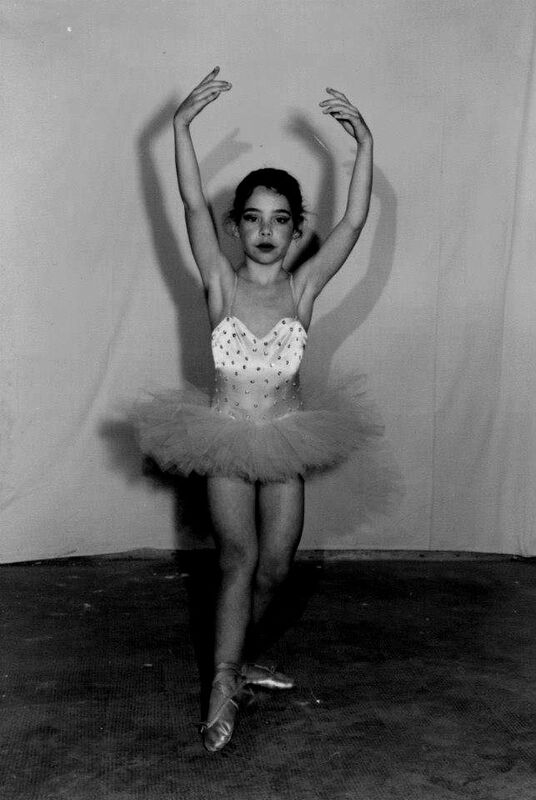 Amparo also graduate as ballet and contemporary dance teacher in Buenos Aires. She had work in some contemporary dance and dance theater companies, like very recently Xavier Le Roy's at Dance Biennial of Venice. She also graduate from National Art University as sculptress. In the visual art field she got many prestigious awards and show her work in many cities of Europe and Sudamerica. In the last years she began to get interest in theater and undertook intensive studies of physical theater, action theater, theatrical improvisation, art of clown, dance theater and butoh dance. In 2014 started to study music and in 2015 bandoneon. *Active female role and couple communication. *Theatricality: Interpretation and expression for social and scenic tango. First than all Amparo is a continuous and curious apprentice of argentine Tango. Reason why her pedagogy is constantly renewed. Students are also a chance to learn. She supported on Dinzel System. It was created by Gloria and Rodolfo Dinzel, Masters of teachers, international fame researchers and dancers, honorary members of the National Academy of Tango. Result of more than 40 years of passion for dance, research and work, it is a compilation of philosophical and scientific ideas, rules, procedures, forms, methods, techniques and mechanics. 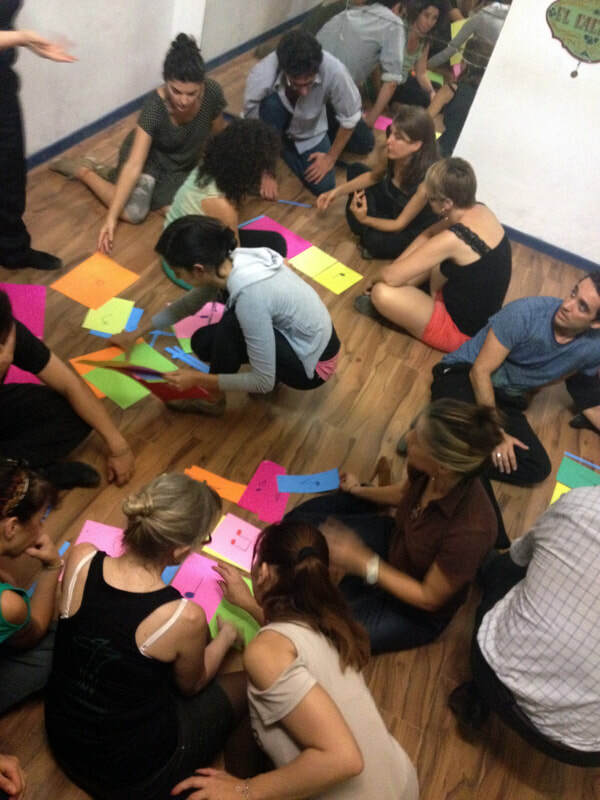 These form a coherent unit, designed for Tango creative development, study, research and teaching. The system is used at Estudio Dinzel in Buenos Aires, at the “Tango Educational Center”, the former University of Tango, as well as by teachers in several countries. It was also the first method used as therapeutic application of tango dance for blind people, Parkinson's disease, young people with down syndrome and as a psychological support for patients in palliative care. We let do to tango, its accommodates to each one, accepts the ways of being, producing little by little a change. Therefore the teaching will be accompanied by this adaptability, learning to accept and observe, to listen and to live in freedom. The technical background of the Dinzel system is specific, detailed and exhaustive without being rigid. It is not a value itself but an instrument to achieve expression and action freedom in our dance. Both roles have equal responsibilities in the dance, making it, a true conversation and adds spontaneity and sparkle to every tango. The female role of the Dinzel system is distinguished by being active, thinking and creative. The male role by the courage to listen to the women's proposals, accepting the challenge to leap into the unknown. To achieve this colloquial state, our research and didactic focuses on communication and expression; in that anxious search for a conscious freedom. Amparo also has a baggage of other artistic studies such as theater, academic dances, music, contemporary art, meditation techniques and body awareness that applies to tango teaching. 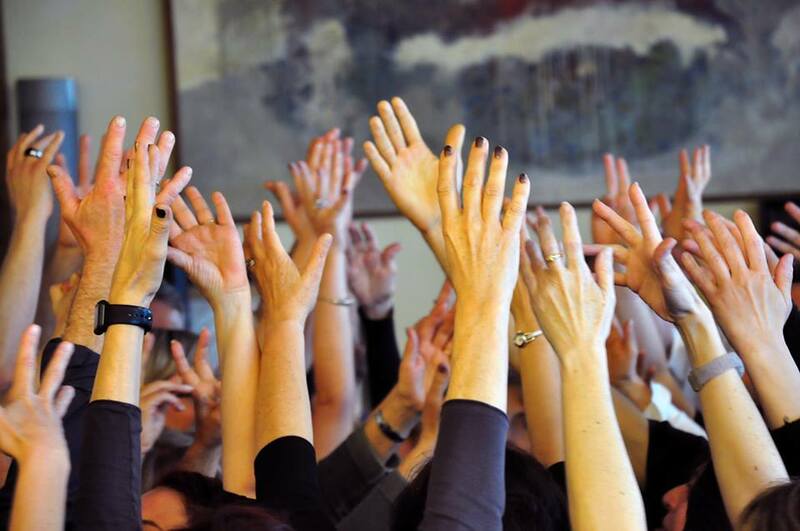 In this line she offers workshops and seminars around the world. The seminars are intensive and detailed training on a specific topic. They also intend to be a guide to access to an empirical knowledge, linked to the concrete experience of certain sensations. Normally the laboratories hold for one or two days on weekends. The laboratory's goal is to amplify our listening skills. Learn to listen, listen to learn. 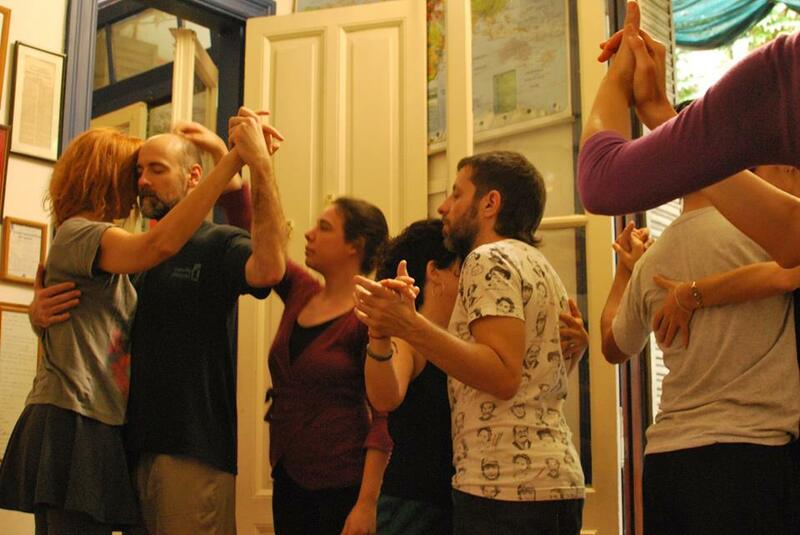 We will apply meditation, breathing and physical theater techniques and training to tango. The aim is sensitizing to listening ourselves, our partner and the human and social group. We approach the Argentine tango on the basis of the Dinzel system integrating the concepts of cell, organ and organism. We will try to integrate in the present moment all the listening levels necessary to enjoy our dance in harmony with the social context. Interpretation, expressiveness and presence in Tango. Taking instruments from disciplines such as dance-theater, physical theater, butoh dance, the art of the clown and supported by the Dinzel System; We will work on the presence, character, listening and breathing applied to the dance of tango. Based on theatrical games, scenic proposals and body awareness training, we will try to explore the emotions that arise in our dance and how to canalize them. 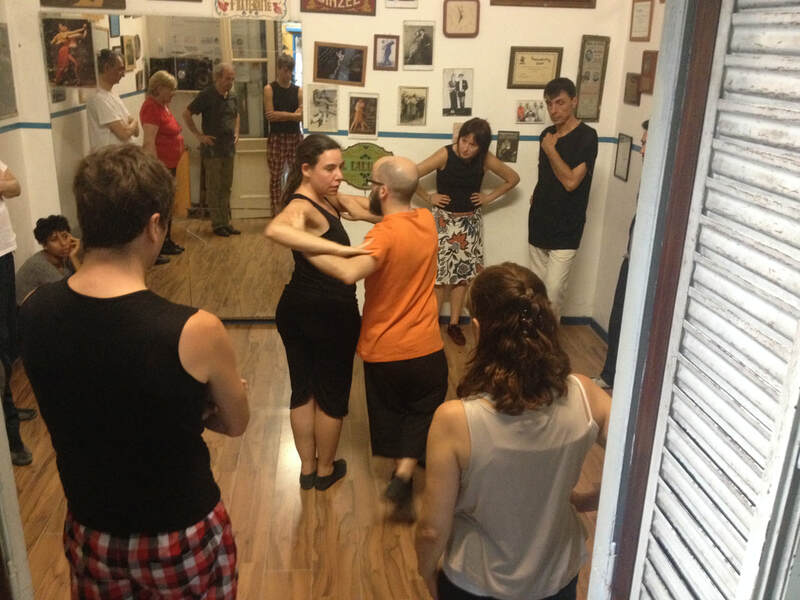 We will try to extrapolate useful tools in those other disciplines for the practice of improvisation in the social and scenic context of tango. "The only truth is freedom, instinct of the human being that expresses itself in the tango as a dynamic symbol and that uses improvisation as its only mechanic." Rodolfo Dinzel. Communication, sense-perception, traditional mechanics of improvisation and creativity. The seminar belongs to a work developed by our masters "los Dinzel". It is an experimental work that aims to bring the participants to what they call "pure state of improvisation" in their theoretical work, in which were the first tango dancers of history. it takes courage from both of us. But we will discover together that we both have the possibility of proposing and we can together build the choreographic discourse, through the same codes of understanding and inside the hug oneness. We intend a masculine role that knows to listen women's proposals and has the courage to accept even on the forms that he doesn't know. A man who recognizes an equal ally in women, to facing dance floor challenges. Both in a conversational state of mind. We are ultimately looking for a final design that is the conjunction of two expressions, in an equal level of efficiency. Amparo offers traditional Tango, experimental tango and queer performances. In tango's ambients or not. Milongas, public and private events of all kinds; such as parties, presentations, conventions, theaters, films, video art and festivals. "Dear Teacher, I met a woman in milonga last night who changed my life. I met you, I met the tango. The improvisation seminar is slowly maturing in my flesh. Sculpting the body is not easy, teaching to do it is divine enterprise. I admire you because you want to sculpt the human living and dancing bodies. You are a Master above all for the fact that it's waht you want to be. You have the vocation to take a person hand by hand and drive him into stormy forests. The universe contains as much wild as order, as much disorder as logic, in between the sea of ​​possibilities, between the uncultivated and the cultivated. The art of dance is the navigation from the complex to the primitive, from the mind to the body. Thank you because you took me by the hand and shown me precious treasures. You have shown me the child joy who looks at the lightning and thunder with shining eyes. I wait for you in my nest to share with you and Seba the enchantment that is depositing in my veins. with love" g?